Australian Catholic Bishops Conference president Brisbane Archbishop Mark Coleridge with Iraqi students Ban Isaqi (left), Hana Keka and Dr Saveen Oghana (right). AN Iraqi medical couple studying in Australia are preparing to return to their war-torn homeland to operate a new and unique Church-run hospital. Dr Saveen Oghana and Ban Isaqi, a dentist, have spent the past year studying master’s degrees at ACU’s Brisbane campus – equipping them with health administration skills needed to run a new Catholic hospital in Erbil in the Kurdish region of northern Iraq. It will be the only Catholic hospital in the entire country. “Establishing a hospital is a challenge, and managing a Catholic hospital is another major challenge in a Muslim-majority country where our people suffered persecution,” Dr Oghana said. Erbil’s Archbishop Bashar Warda, a Chaldean Catholic, chose the pair to come to Australia to study, and be part of Christian rebuilding efforts after years of war and conflict and the displacement of Iraqi Christians across the world. Archbishop Warda’s vision is to restore high-quality health and education services, and help Christians return to their towns and villages. The couple were already familiar with Archbishop Warda’s plans, having worked as volunteers for the Church in Erbil – Dr Oghana for 10 years and Ms Isaqi for more than five. Dr Oghana was the co-ordinator of the St Joseph Charity Clinic set up to treat Christians who fled from the Nineveh Plain to Erbil and became internally displaced persons. He praised ACU for the skills he has learnt during the past year. “Really (it’s been) quite a wonderful experience studying in Australia,” he said. Building work on the new hospital is completed and one of the first tasks for the 29-year-olds will be recruiting staff as the final furnishing stage gets underway. During their stay in Brisbane, the medical couple have lived in Banyo Nundah parish, close to the ACU campus and occasionally joined worshippers, including Iraqi refugee families, at neighbouring St Joseph and St Anthony parish, Bracken Ridge. They returned to Bracken Ridge last Sunday morning to farewell their many supporters. “They have experienced the suffering of minorities in Iraq,” parish priest Fr Gerry Hefferan said. “Both have been studying a master’s degree at ACU in Brisbane. “They obviously have a healing ministry. “They also have a ministry of advocacy. “They have a prophetic ministry to name reality and to bring hope, and a ministry to love people as their neighbour. 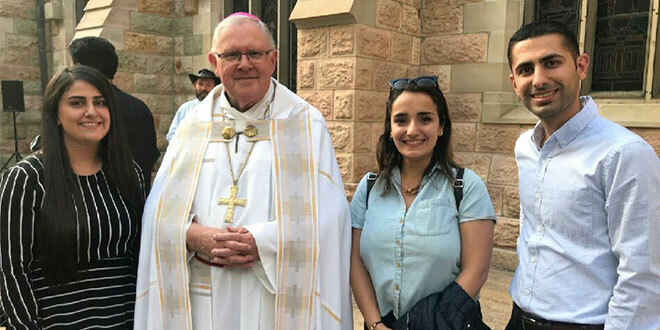 Iraqi’s Chaldean Catholic community recently sent a third student, Hanar Keka, to further her education studies at ACU’s Brisbane campus, before returning to Erbil.